Be inspired by cutting-edge speakers and deep spiritual experiences. Learn to mobilize through a public rally, Town Halls, workshops and social justice exhibits. Leave with action plans for your own community. 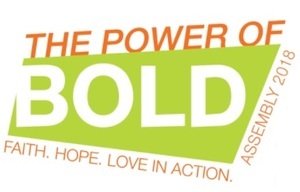 At “The Power of Bold” United Methodist Women Assembly you’ll be filled with the faith, hope and love that moves women to action. We focus especially on women, children and youth—groups often left behind.